This is the first book on the Ancient Hawaiian sites of the Land Districts in Nāpali Coast State Park. The first book is on Miloliʻi Ahupuaʻa, will be published in 2019 and should be on Kauaʻi by May at the latest, after printing and shipping from mainland USA. This very Limited Edition Hardbound, archival book 12.25 wide and 10 inches tall with over 150 pages. To view a video of the book, click below. Extensive research was done into the ancient Hawaiian legends and newspapers by Dr. Keao NeSmith, Kauaiʻs preeminent Hawaiian scholar. And archaeologist, Alan Carpenter, Myra Tomonari-Tuggle, Martha Yent, Summer Moore and Dr. Jennifer Kahn have written on their research and findings in Miloliʻi. It opens with the Hawaiian place names, winds of Miloliʻi and ancient Hawaiian legends, to pay homage to those that lived here for over 700 years. Each section is broken down into the basic types of sites, such as Heiau or Hawaiian temples, with if possible their name and any information from Hawaiian sources or scientific research. For us this book was produced as my way to Mālama Miloliʻi, to care for and help protect this sacred land through documentation and education. 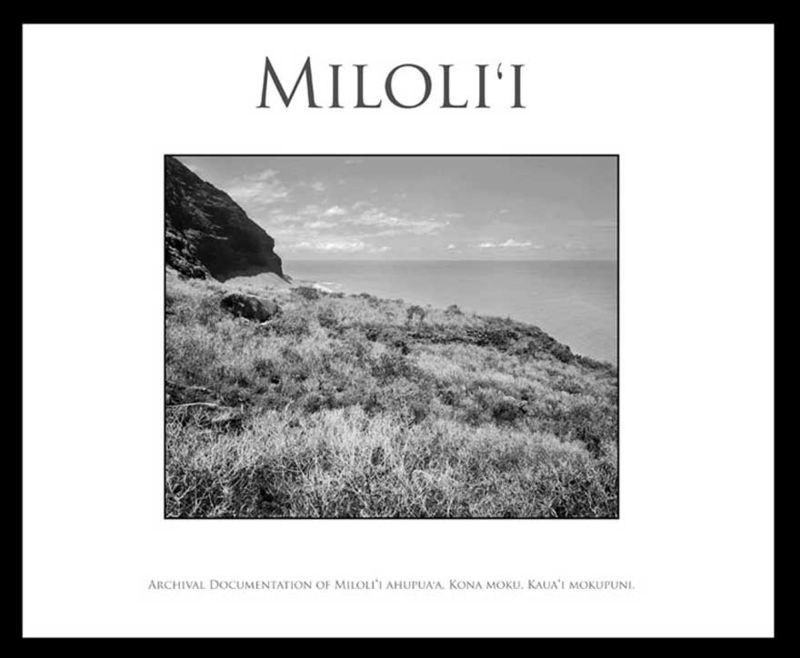 of the Miloliʻi book in 2019. In 2019 we will have an Exhibit on Kauaʻi please check back for dates.